Bore Tech Eliminator™ Bore Cleaner is the premier, state of the art bore cleaner that has taken the shooting industry by storm. The revolutionary and patented formula is 100% barrel safe, biodegradable and easily outperforms the competition. Eliminator rapidly removes carbon and copper fouling without the safety hazards, harmful toxicity, and unpleasant odors found in competitive cleaners. Bore Tech Eliminator™ Bore Cleaner is the patented, fast-acting, barrel safe, non-ammonia bore cleaner that has taken the shooting industry by storm. Eliminator has been proven to surpass the rigorous demands of the modern day shooter and is the cleaner of choice by shooters worldwide who demand the best. Eliminator’s proprietary formulation is a combination of ingredients that can simultaneously cut through heavy layers of carbon and copper fouling that accumulate during shooting. Eliminator begins its assault on fouling by utilizing a strategic blend of chemical surfactants that quickly loosen and release carbon deposits from the barrel’s surface. These surfactants also effectively neutralize all corrosive residues preventing barrel damaging rust and corrosion. During the removal of carbon fouling, Eliminator also uses an unparalleled process that rapidly oxidizes copper fouling and suspends it in the cleaning solution, rendering it unable to redeposit onto the barrel surface. This exclusive technology allows for the continued and complete extraction of both carbon and copper fouling at full strength without becoming saturated and losing effectiveness. Bore Tech Eliminator is 100% ammonia free and barrel safe. It will not etch or harm barrel steels and can be safely left to soak in the bore for an infinite period of time. In addition, the Eliminator also contains a short term rust preventative, which shields and conditions the firearm’s bore after cleaning. Just dampen your last patch with Eliminator and your bore will be protected against rust and corrosion for up to 2 weeks. Bore Tech Eliminator is the premier, state of the art bore cleaner that quickly eliminates carbon and copper fouling without the hazards, toxicity, and odors found in competitive cleaners. Rapidly remove fouling from your bore and all the other cleaners from your bench… Bore Tech Eliminator Bore Cleaner. Are your firearms Bore Tech Eliminator Clean? Eliminator™ Bore Cleaner has all of the most important features that any gun cleaning solvent should have. Please see our convenient and easy to use Chemical Selection Guide by clicking the below image or going to the Knowledge Center. 1) Wet 3 to 4 Bore Tech X Count patches with Eliminator Bore Cleaner and individually push through bore to remove loose fouling. Only push patches through the bore in ONE direction. 2) Next, make 10 to 15 passes with a tight fitting Bore Tech Proof-Positive Nylon brush saturated with Eliminator. 3) Then repeat Step 1 and let Eliminator soak for 3 to 5 minutes. For badly fouled rifles, extended soak times may be needed. 4) Finally, push dry patches through the bore until they come out clean. 5) Repeat above steps if necessary. 6) Before storing firearm, dampen a patch with Eliminator and push through bore. This will protect against rust/corrosion for up to 2 weeks under normal storage conditions. 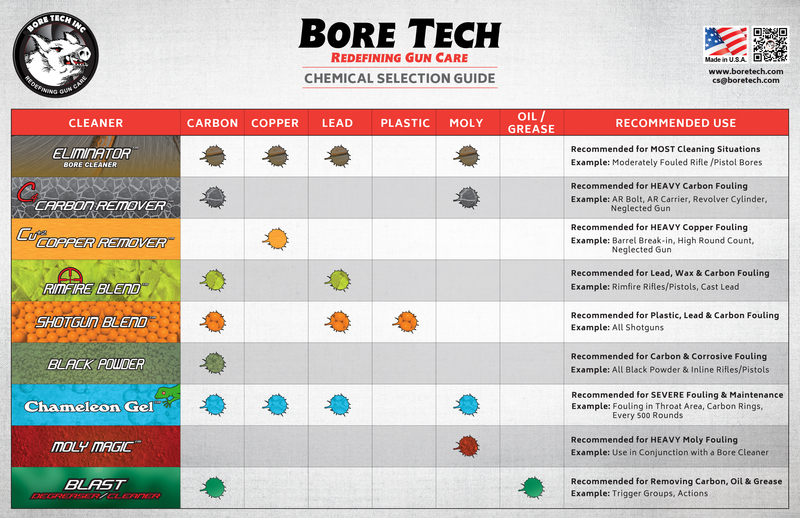 7) For extended storage or in adverse conditions apply Bore Tech Friction Guard XP Gun Oil. 8) Before using firearm, always run a dry patch through the bore. This will remove any residue and ensure against obstructions. Q: What is the difference between Eliminator, Cu+2 Copper Remover and C4 Carbon Remover? A: The Eliminator removes both carbon and copper fouling and is recommended for most regular fouling situations. It provides a quick, easy and great overall clean. For extreme fouling situations the specific Cu+2 Copper Remover (Copper Removal Only) and C4 Carbon Remover (Carbon Removal Only) are recommended. These solutions directly target and effectively focus on removing their respective fouling types. Please see our Chemical Selection Guide located in the Specification Tab or in our Knowledge Center for more information. Q: Is Eliminator safe to leave soak in a barrel overnight? A: Yes, the Eliminator can be left to safely soak in barrels for an infinite time period. Q: Does Eliminator contain ammonia or any other barrel damaging components? A: No, the Eliminator Bore Cleaner is 100% barrel safe. Q: Is the Eliminator safe for use on chrome lined barrels? A: Yes, the Eliminator can be safely used on chrome lined barrels, chromoly steel barrels, stainless steel barrel and any other commonly used barrel steel. Q: Is the Eliminator safe if it gets on my rifle stock? A: The Eliminator is safe on all polymer, fiberglass, laminated or polyurethaned wood. However, if the Eliminator comes in contact with an oiled wooden stock, it might cause a blemish by removing the oil and require reapplication of sealing oil. Q: Can Eliminator be used on the outside of my rifle barrel? A: Yes, the Eliminator can be safely used on the outside of a rifle barrel to remove copper fouling. Once finished cleaning be sure to wipe the cleaned area dry and apply Bore Tech Shield XP Rust Preventative. Q: Can Eliminator be used on nickel plating? A: Yes, the Eliminator can be used on nickel plating but cannot be left in contact for more than 3-5 minutes. Extended contact can lead to darkening or discoloration of the plating. Do not use on plating that has been damaged or worn. Q: Can Eliminator be used as a lubricant? A: No, the Eliminator Bore Cleaner is a cleaner not a lubricant. Use Bore Tech Friction Guard XP Gun Oil for superior lubrication. Clean your barrel with the old stuff like we all have for years. When you think your done and the barrel is clean; come behind old school cleaner with the Eliminator and be prepared to be amazed. I have left a grand total of maybe 2 reviews online for products in the past. I will be leaving a few more this evening for Bore Tech products. Your products ROCK and this cleaner is unmatched. THE BEST HANDS DOWN!!! I spent 7 yrs Marine infantry and Federal LEO for 6yrs I have a ton of other products on the bench but sadly I have to say Bore Tech was not one till this month. I have the Eliminator Bore Solvent, Copper Remover and Carbon Remover. This solvent is amazing. I am a nut for keeping firearms clean thanks the the Marine corp but also being a LEO you have to trust your life to the gear you use on or off duty. This stuff cleans what other products leave behind! This is the best product I have ever used. I could not believe how great this stuff worked and your cleaning rods and jags are the best I have ever used. Just buy their stuff and you will see how great it is. Thanks Bore Tech for the best products I have ever used. You have a costumer for life.